Green lights over a lane means things are clear, yellow signs means there is some sort of problem, and red signs means the lanes are blocked. Nearly 100 signs mounted on 11 overhead structures spanning the Interstate 80 in the East Bay were flicked on Thursday morning. They are are supposed to help ease the traffic woes of commuters from the Carquinez Bridge to the San Francisco-Oakland Bay Bridge. Caltrans spokeswoman Shannon Brinias said the I-80 "Smart Corridor" signs will remain dark unless a lane-blocking incident occurs. If there is an accident, for example, the signs will light up with graphical traveler information to help guide motorists into the clear lanes, she said. Green lights over a lane means things are clear, yellow signs means there is some sort of problem, and red signs means the lanes are blocked. An average of 25 collisions or lane-blocking incidents are reported in this corridor daily, Caltrans said. The hope is that the signs will guide drivers out of blocked lanes and provide a clear, safer path for emergency responders, she said. A new network of signage is about to make drivers "smarter" along one busy bay area traffic corridor. 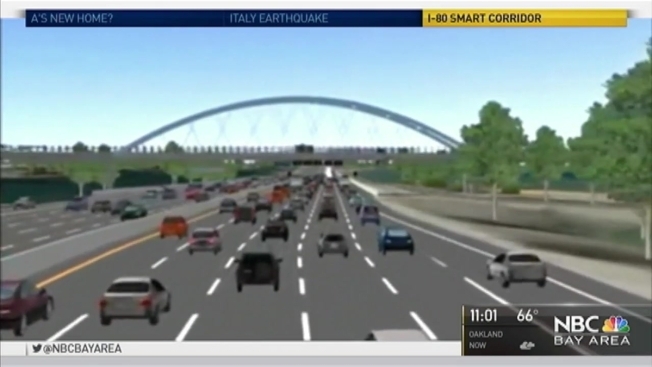 Caltrans is calling it the "I-80 Smart Corridor" and the agency is promising it willl change the way you drive. It involves new overhead signs and traffic information boards, along westbound 80 between Richmond and Emeryville. Caltrans believes it may even cut commute times. The entire project is expected to be up and running by September. The project began in 2011.